Congratulations to the 2018 Undergraduate Research Conference prizewinners! On Thursday, October 4, 2018, sixty students presented their research projects at the fourteenth annual Faculty of Science Undergraduate Research Conference (URC). McGill judges had the arduous task of choosing the victors (see below). The prize ceremony took place in McGill's elegant Moyse Hall, and followed a very special keynote address (see also below). 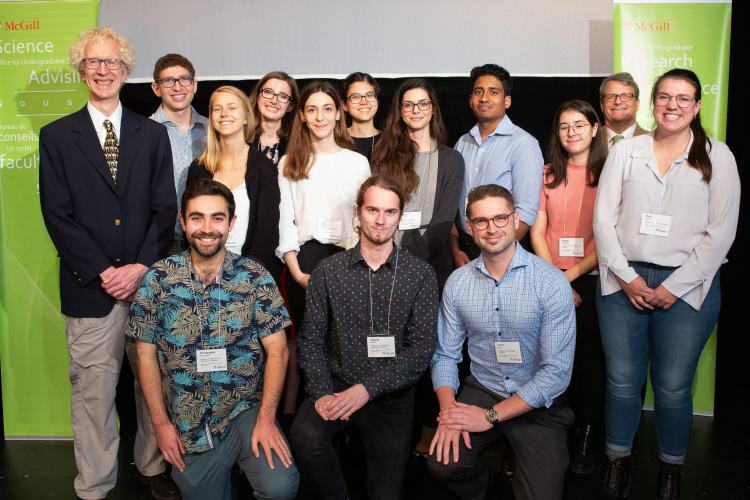 The day culminated with a reception for students, friends, and alumni, where everyone celebrated the accomplishments of McGill Science students. John Stix is a professor in the Department of Earth and Planetary Sciences, and Associate Dean of Research in the Faculty of Science. His research focuses on the study of active volcanoes: how they work, their subsurface plumbing systems, and forecasting their behaviour. His research team, which includes undergraduate students, conducts fieldwork on active volcanoes in Iceland, Italy, Latin America, and the USA. Currently, he is developing new instrumentation to study volcanic activity using specialized sensors and drone technology. He teaches courses in volcanology and natural hazards, and was a co-developer and co-instructor of a massive open online course (MOOC) on natural disasters from 2014-2016.